The rest of the day will be spent curled up with Schecky on the couch. The croup is 100% gone, but he started running a low fever again yesterday afternoon. He seems to feel OK,but he's a little droopy and very snuggly. We're going to watch the ABC Family marathon of Christmas Specials today*, and work on stringing pompoms. Last night, we watched Elf. I had forgotten just how amazingly good Will Ferrell was in that role. If you've never seen it, I do highly recommend it. He really captures that "little kid wonderment at being in a grown up world that doesn't really make sense to him" thing better than anyone since Tom Hanks in Big. *TiVo alert! "The Year Without A Santa Claus" is on tonight at 5! That Heat Miser slays me every time... Plus, you have Shirley Booth, TV's inimitable Hazel, as the voice of Mrs. Claus - what more could you ask. When I was pregant and I saw that light. I made my husband stop...everyday. Umm dounuts! 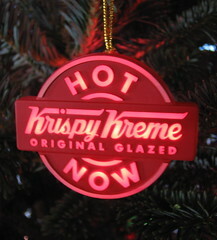 i totally miss krispy kreme. when i went into premature labor with darwin, my doctor yelled at me for not gaining enough weight, so aaron made me eat a dozen doughnuts every two days to gain weight. griffin gained quite a bit of weight too. our favorites are the blueberry glazed and classic glazed with chocolate. they really need a gluten free recipe. Now I want a doughnut. Thanks! the breakfast scene in elf is the best! and now i have to find those doughnuts, such a cute concept! HOw jealous am I! No KK is sight here. I love that ornament....and for a buck - too cute. My little guy would flip over that. We drove by Krispy Kreme yesterday! And let me tell you, we were sorely tempted. I hope Schecky's feeling like himself again soon! Nate stayed home from school with a barky cough one day last week -- no fever or anything, and I'm pretty sure I could have sent him to school, no problem. But I kept him home and took him on all my errands with me that morning instead. And he was miraculously cured by about 2 pm! Mmm, I sure could use a hot donut right now. Darned, I missed seeing the Heat Miser! We actually had ABC family on for most of the day, though I kind of tuned out when Nestor, that long eared donkey special came on. Donuts, Christmas trees, time on the couch with your child and ELF. That pretty much sounds like a fantastic Saturday!! I love Elf. 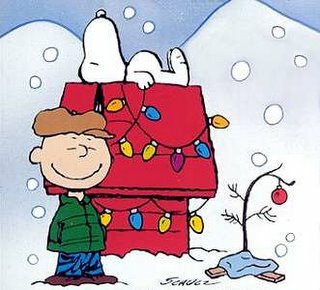 I think it has become my favorite holiday movie. Even surpassing "you'll shoot your eye out, kid!" And that's saying something. no way! what kind of KK donut was that? blueberry? oh, if it was blueberry. and i LOVE the ornament. can one buy them at KK stores? this might mean a trip to your beloved Kingsport. I know several folks who'd love one of those. what are krispy kremes?? ?/ sorry, had to ask that. love the tree decoration even tho' ni have no idea! I'm excited that The YEar without a Santa Claus is on tonight here in the NW! I just costumed my son as Cold Miser last weekend! (See my site, last Sat.) I am here via Creative Little Daisy. 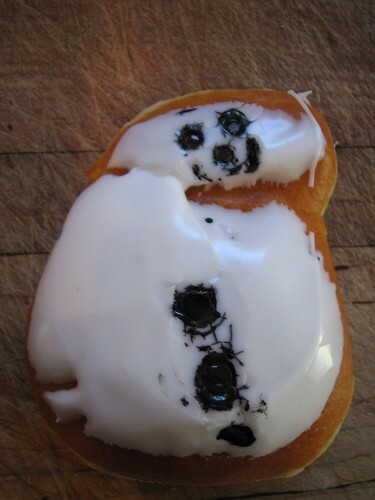 I really wanted one of these snowmen doughnuts, but I haven't gotten my hands on one yet. I'm not even sure where the Krispy Kremes are here.